EDIT: Apparently the gambling community also loved the Jags +9.5 because the line dropped to +8 in the time it took me to write this post. Oh well, I stand by the analysis. This Pittsburgh offense hasn't looked like the juggernaut that many were expecting coming into this season. Big Ben talked about retirement in the offseason and he certainly seems like he's lost a step. Two-thirds of the Bell/Bryant/Brown combo have not been as productive as expected. 9 and a half is a lot of points to cover and the only teams that the Steelers have blown out this season were the Vikings in Case Keenum's first start and the Marshal Yanda-less Ravens--who have been a complete disaster AND also went down to this Jacksonville team in one of the most lopsided contests of the season. 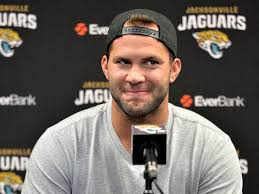 Although Sir Bortles is stuck playing Stateside the rest of the season and won't be getting the London Bump, the Jags in general have been surprisingly competent. They have the 5th ranked offense by points scored and are ranked in the top 10 in total DVOA per Football Outsiders. FO has Pittsburgh ranked higher, but the Steelers have historically been a team with a tendency to play down to their competition to a certain degree (for example, the 3 point victory over the dreadful Browns in week 1). Keeping in mind this huge spread, I'm feeling really good about the Jags this week. I mean, how can you not like this guy getting 9.5? Your pick hit the blockchain 149 minutes before gametime. You've won 4 picks in a row.